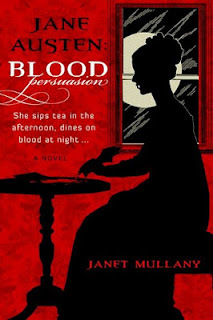 Blood Persuasion by Janet Mullany is the second in the "Immortal Jane Austen" series. This story takes place approximately thirteen years after the action in Jane and the Damned and we learn that Jane did take the water cure. For the past thirteen years she has been living quietly with her family and continuing to write. Jane's father has died but she continues to live with her mother and sister Cassandra. Jane's niece has been sent to stay with them because of her scandalous and flirtatious behavior. What could be worse punishment that being banished to the countryside with her widowed grandmother and spinster aunts? But things in the countryside are not quite as bland as one might think, especially when two warring factions of "The Damned" move in. Vampires are no longer wholly accepted in polite society, thus the retreat to the country. Having "the Damned" as neighbors is bad enough but Jane's Creator as well as her former vampire master and lover have taken up residence nearby. Their visit coincides with several mutilations and attacks on the village. The higher class vampires are at odds with the lower class vampires termed le Sale. These lower class vampires have often been banished and hunt without regard for alliances or allegiances. Jane's creator is attempting to diplomatically stop Les Sales from their wayward behaviors. Of course Jane and her family are stuck in the middle. Jane's niece is enthralled with the leader of Les Sales, and even her own mother and sister can't seem to understand why Jane wishes to restrict their friendship to them despite her warnings. Jane must battle her inner demons as it appears she was not cured in Bath, while caught in the middle of the battle between the vampire groups. She must also deal with her attraction to her creator and his brother, as well her dormant feelings toward her former lover. Blood Persuasion was slightly more credible for me than Jane and the Damned, but I still found it problematic. For basically thirteen years Jane has lived a quiet life free from vampirism but as soon as the vampires return to the countryside her desires for blood return. This behavioral change along with the idea that she actually pondered making one of her characters in Mansfield Park a vampire, basing the relationship of Mary and Henry Crawford loosely on that of her former lover and his sister, wasn't very believable to me. It did tie the notion of her vampirism and experiences as a vampire in with her writing but it seemed to be rather gratuitously thrown into the mix. The characters and the action in Blood Persuasion are slightly more developed and more in keeping with 19th century society. 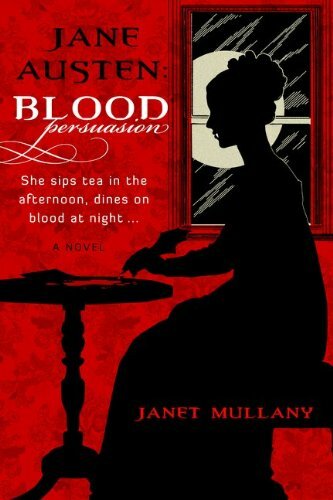 Blood Persuasion isn't a bad read, all things considered, but it just wasn't the right fit for me.